Audio Book Has Been Released! Well, for all you audio book lovers out there, enjoy! It is avaiable in both CDs and MP3 downloads. UPDATE: We are officially back in stock and shipments are going out! Thank you for your patients. If you are in a store that does not have a copy on the shelves, just ask customer service to order one. Hello! I hope everyone had a wonderful Christmas! 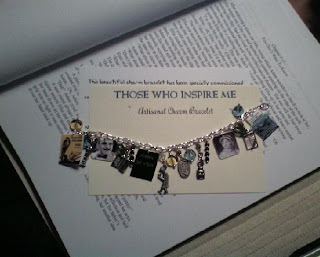 I absolutely had to put up pictures of my favorite gift, because if you are a writer, avid reader, or mystery lover, I’m sure you’ll love it too. 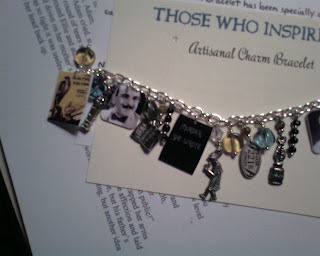 My sister found a lady who makes custom charm bracelets and put together one called, “Those who inspire me.” It has a portrait of Jane Austen, Hercule Poirot, Sherlock Holmes, the cover of the Maltese Falcon, the Murder She Wrote title, a quill, the address plate for 221B Baker St., even a little type writer printing the words, “It was a dark and stormy night.” Lol. My sister is always excellent at finding perfectly personalized gifts, but this took the cake and made my Christmas. She even made me wait until everyone else had opened all of their presents. UPDATE: Before I forget, we are back in stock at Barnes and Nobles and my publisher sent word that a large shipment went out last week, so everyone should be back in stock soon! Thank you for your patience. My dad and brother were also working, but both of their cars were struck dead that month, so my poor mother had to drive them to work and pick them up. Naturally, they worked on opposite ends of town. Throw in some seriously biting cold and needless to say by the time we all got home our traditional Christmas Eve dinner of hand-made manicotti just wasn’t going to happen. Enter modern convenience! Turkey and gravy in a microwavable pouch that takes only seven minutes. Roasted garlic mashed potatoes, from flakes to creamy in just three and a half minutes. Candied yams that only needed to be poured from their freezer container into a pot and stirred until warm. And the cranberries needed only a can opener to grace the table. Yes, I know some of you are appalled out there, but honestly it was one of the best Christmas Eve dinners I’ve ever had…plus the whole idea was so fun. We did manage to set out the nice china for the meal, but we all opted to wear pajamas to the table. Tradition just isn’t any fun if you can’t spice it up every once and a while. I’d just like to give a quick thanks to everyone out there who has helped me during this progress. First, thanks to all my friends and family who helped me edit this project when it was nothing more than a stack of paper with a lot of grammatical errors. I wouldn’t have gotten this far without you. Thanks to every person who’s bought my book. I love you people! If you’ve told a friend, handed out one of my business cards, or written a review I’m praising God for you right now. It’s an incredibly humbling experience every time I stop and think about how many wonderful people God has put in my path. Even if we’ve never met, I want you to know how much I appreciate you. I’m sorry if the slow distribution has kept you from getting your books. Hopefully the more we sell, the quicker the distributor will get books back in stock. Praise report first! As you might have read on my homepage, my book has temporarily sold out at the major website providers. Obviously, this is good news. The book is selling! I actually needed to sell out the stock within sixty days of the release date, but instead it happened in just a little over a week. God is so good. I’m not sure how long it will take to officially get it back in stock. According to my publisher, a new shipment has been sent out to the distributor and we are now just waiting for the distributor to update its system. Patience is a virtue…but I’m still checking Amazon everyday to see what they say. So, if you need a book before Christmas, it’s best to order directly from my publisher or contact me. But everyone be warned, it’s coming down to the borderline to order anything and still hope that it will make it to your house in time for Christmas. Eleven days left! Can you believe that? And if you have ordered my book already, I’d officially like to say THANK YOU. You’ve made this the best Christmas! If you love Jane Austen, then you’re probably like the rest of the Austenphiles who regret that she only wrote six novels. Sad indeed, but thankfully fan fiction (books written to continue, compliment, or modernize Austen’s novels) has become quite popular and a lot of fun. I’m sure there are purist out there who don’t like this idea at all, but I assure, if you’re in the need of a fun Austen fix this is the road to go. This post might be a little long, but I’m going to write out a list of my favorite fan fiction picks and give you a heads up about which ones to avoid. 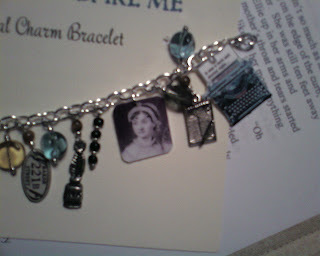 Plus, if you have a Jane Austen fan you need to buy Christmas presents for, this is a good place to start. The ultimate in Austen fan fiction, this series is so beloved by fans, many have dubbed the author Lady Pamela. This is a clever and interesting attempt to modernize Jane Austen novels, by bring the classic characters into modern times and having them face modern issues…which turn out to be very similar to the issues girls faced two centuries ago. They are generally fun, light reads. Published in 1913, this is considered to be the first attempted at fan fiction. The author basically takes all of the characters and situations from the six original novels, cuts them up, scrambles them around, and puts them back together in a way that is meant to marry off the remaining single characters. So, Kitty Bennet finds herself in the match-making hands of Emma, a reformed Mary Crawford is now butting heads with Lady Catherine de Bourgh, and poor Georgian Darcy is in quite a romantic mess with a number of suitors from different novels. So far, I’ve read the first two in this series. These book claim to be the long lost diaries of Jane Austen herself, in which we find out that she became a bit of a private investigator during several Regency Era murder mysteries. It’s an interesting series combing mystery, Austen wit, and a little bit of a hardboiled detective edge. While the fan fiction genre has provided me with several hours of enjoyment, there are a number of books out there that would make Miss Austen turn in her grave. This one had so much potential, but it ended so badly I returned it. To put it simply, giving Elizabeth Darcy some mystical connection to the spirit world that allows her to stop a crime is silly. Actually, it was outright dumb. Just be careful and enjoy a little Regency romance and mystery. But the real process was much more interesting. -It started with a basic cleaning up of the accepted manuscript based on a set of guidelines my publisher sent me. -Then I was put on an editing schedule. -Next I was contacted by editor who gave me a list of deadlines for the editing phase. -Then over the next three months my editor and I traded the manuscript back and forth. She’d send me a copy with color coded suggestions and changes and I’d send her back a color coded edition with changes and questions. Some of her comments were actually quite amusing. There were a few that suggested I was not romantic enough. Happily by the end of the editing she was pleased with that particular subplot. -I had to read the story out loud to check for more mistakes. Word to the wise: Don’t attempt this in one day. By 4:00 I had lost my voice. -Next was the cover design phase. After a phone call with me, my graphic designer presented me with three different ideas for the cover. Feeling rather guilty about it, I rejected all three. They were very good, but they didn’t represent the story well enough. Thankfully my mom actually found two great images on the photo site my company uses and my Graphic Designer did a great job with them. -Then came layout, where what the inside of the book would look like was designed. -A complete copy was then sent to me to look at one last time. It was horrific to realize how many red marks actually needed to be added. -Choosing an audio book reader came next. The editing phase of this project is still in progress. In total, I read my book ten times this year. All and all, I’d have to say I had a blast. I don’t care what J.B. Fletcher thinks, this was fun. Are you looking for a way to use up that leftover turkey? This is one of my favorite recipes for just such an occasion, though I have to admit, I was asked for this recipe after admitting that under influence of cold medicine I burned this year’s meal black. However, if you do things right, this is a really easy, delicious meal. Spray a baking pan with oil then coat the bottom of the pan with some of the sauce. Set aside. Spread a layer of cream cheese on the tortilla. Slice the turkey/chicken, and put several strips down the center of the tortilla. Drizzle sauce over the chicken and sprinkle the shredded cheese over it all. Roll the tortilla up and place it in the pan. Coat the outside with the sauce. Make sure you cover the whole thing with the green chili sauce, because it keeps the tortilla from drying out. Now all you have to do is put it in the oven and bake for 30 minutes. That’s all there is too it. Everyone once and a while we just need a story to laugh at. One year we were invited to have Thanksgiving at a friend’s house. After a little negotiating, it was decided that we would provide the desserts for the meal, including the ever important pumpkin pie. So, on Thanksgiving morning my mother, sister, and I set out to make our desserts with every intention of having everything ready by the early afternoon. I should mention that this was just about the time my mom began to discover she needed reading glasses. My sister and I were just beginning our assignments when we heard my mother cry, “Oh, no!” We turned to find her squinting at the bottle in her hands as the fragrant smell of garlic filled the kitchen. Somehow the garlic and cinnamon bottles has been place dangerously close together. Consequently, about a tablespoon of garlic was dumped into the mixing bowl, right on top of the pumpkin. Naturally we didn’t have enough pumpkin to start all over, but how could we show up without a pumpkin pie? Mutiny would surely be the result. The only option was to scrap out as much of the garlic as we possibly could and pray that nobody would notice. I have to tell you, that was the best pumpkin pie we have ever made and quite a few people agreed. Still, we are too afraid to give that particular recipe another try.